This is one of the more lighthearted and whimsical urns that we carry. 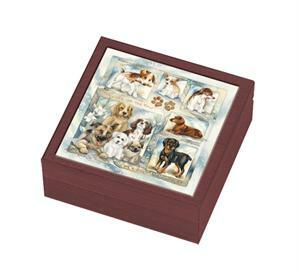 This urn features a design by Jody Bergsma with a variety of puppies and dogs in various stages of play. Among the breeds featured are the Dachshund, Pug, Chihuahua, Rotweiller, German Shepherd and others. Nestled between the pictures are popular sayings such as: "Furry Cute", "The Luck Of The Paw", "Best Furfriends" and "It's A Doggy Dog World". While this urn is not big, it can hold the ashes of a small dog comfortably and could also be used as a keepsake urn for a larger dog. Crafted of wood, made in Poland.